passable only to monkeys, sloths and toucans. The compound consists of five separate buildings - the principal living area with 25 ft ceilings houses the kitchen, dining and living rooms. A large covered terrace adjoins this building and offers open air dining and living areas. A two story building with wide covered terraces contains five bedrooms and bathrooms, all with ocean views. A separate building houses the master bedroom which is adjoined through a walled garden to two additional bedrooms. A fourth building contains a large family/entertainment area and sleeping loft with king size bed. The 10th bedroom is in an apartment above the garage. An amazing property in an amazing location. We had a total of 28 people in our group. The property handled all 28 without issue. Everyone had a wonderful experience. We were there to celebrate our 50th anniversary and it was a celebration we will cherish always. We were a party of 11, and found the house to have plenty of room for all of us. We had 3 bedrooms unused. The house was very comfortable, and very clean. The young woman who came in daily to do housekeeping was so awesome. She came in, cleaned up dished, beach or pool towels, made beds, provided clean towels, all without intruding on our activities. The manager of the house was always available for questions and help when we needed. The owner recommended Heaven's Kitchen to come in to cook for us, which was worth every penny!!!! They are very easy to work with, and made the most amazing dinners!!! Perfect portions, and perfect taste!!! There was a cat living at the house, who was pregnant and gave birth the night before we checked out, so we all felt like new parents before we left!!!! My only negative comment is that parts of the house didn't look quite as nice as the pictures. There was some visible wear and tear on certain areas, especially in the kitchen, but nothing that couldn't be worked around. The view from the house overlooking the ocean was absolutely one of a kind. For the past 23 years, our extended family has gone on a yearly vacation. We started with eight of us, and now number 17. This was, without question, our favorite location and property. We spent every day amazed at the view from the pool and the convenience of multiple buildings on the property. First off, the location is magnificent. The photos really don't do it justice. Whether sitting on the patio, or lounging in the pool, you are surrounded by lush green, with a beautiful view of the Pacific Ocean. Having multiple buildings with bedrooms allowed folks to sleep in without being bothered by the folks up and about in the main living area. We used Marcela with Heaven's Kitchen to cook the majority of our dinners and lunches and couldn't have been happier. Each meal was wonderfully prepared and delicious. We all enjoyed not having to deal with shopping, cooking and cleaning. I can't say enough about how much that impacted the vacation. The town of Dominical is priceless. It's small and rural and we loved it so much more than the bigger towns in the area. It has a very laid back vibe and great restaurants. Two things to note: first, the drive up to the house is scary. It's literally a 45 degree angle up the driveway. Going down it in the rain is also challenging. Second, you really can't walk to the beach. You'll need a 4x4 to do it. The owner was always very responsive to our emails. The staff on the property did their bestg to make our stay great. This is a WONDERFUL property. We got to call the villa our home for 4 nights. No one wanted to leave!!! There was plenty of room for the 18 people staying there and for the 8 people staying at another villa to join us for dinner. The caretakers are top notch and really took care of us while we were there. It was almost everyone's first trip to Costa Rica, and this villa helped us show why we love the Dominical area so much! Thanks for everything! 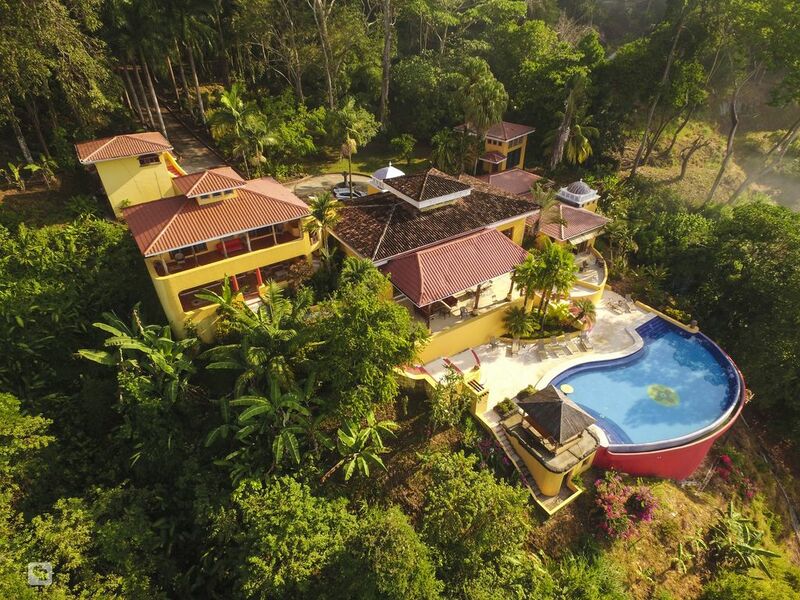 Casa Amarilla was a perfect destination for our family reunion of 21 Costa Rican Americans. The common spaces were roomy, comfortable, and full of breathtaking views. The pool is a perfect place to cool down, relax, and enjoy the views of the ocean and the lush greenery. The bedrooms and bathrooms were fine - nothing special but with daily housekeeping they were always clean and well kept. The Heaven's Kitchen team organized by Marcela and led by her sister and chef, Esmerelda, along with other family members was an important part of our special experience. Not having to worry about shopping, cooking, and cleaning the kitchen made for a very relaxing vacation. We opted for "comida tipica" or traditional Costa Rican cuisine - and it was all just so good! We highly recommend Heaven's Kitchen. Dominical Surf Adventures handled our transportation to and from San Jose as well as several activities including rafting, kayaking, and zip-lining. They are easy to work with and the guides were great. Norma and her husband Henry own and operate the business - they were great. We rented a few large SUVs from Alamo in the town of Dominical and were really glad we did. It's probably a mile walk to town with the return trip up a very steep hill. You really do need the cars for quick trips to the market, drives to the beach, etc. The only slight negative that I would point out is that the kitchen could use some updating and it's not particularly well stocked with things like paper towels, utensils, etc. We loved Casa Amarilla and hope to return sometime down the road!